For a short time, the Rosslyn BID’s Kayt McKissick endured a traffic-choked car commute to Tysons Corner from her home in Northeast D.C. It didn’t feel right. She and her husband, Phil, have always ridden their bikes everywhere. A native of Northern California, Kayt grew up riding road bikes with her dad. As an adult, she’s mountain biked in the Mandara Mountains of Nigeria, on trails in Cabo Verde, across the state of Iowa, and from Pittsburgh to D.C. via the GAP and C&O Canal trails. When she lived in San Francisco and Oakland, biking was always part of her commute. So when she started working at the Rosslyn BID in July 2014, she was excited to ditch her car and get back to bike commuting. Rosslyn has great access to trails and roads with bike lanes, so it’s a terrific place to ride for business or pleasure. In the morning, Kayt’s ride to Rosslyn from Capitol Hill takes her past the U.S. Capitol, the Supreme Court, Library of Congress, the National Mall and the Lincoln Memorial. 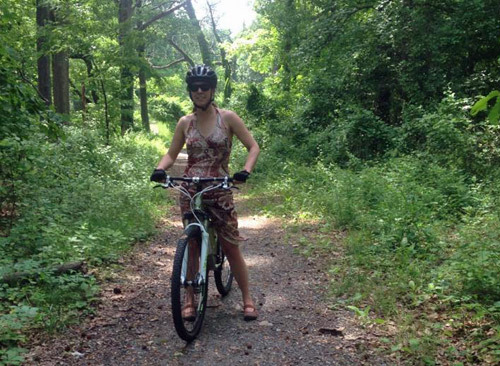 She takes Memorial Bridge into Arlington and then gets on the Mount Vernon Trail and heads north toward Rosslyn. In the evening, she crosses the Key Bridge and rides the bike lane on M Street most of the way home. Use Google Maps to plan your route and start with routes that look less stressful (e.g., those with bike lanes). Scope out the facilities at work, such as showers and changing areas. Invest in gear, such as panniers, a headlight and other safety gear. It’ll last you a while and make your commute easier and safer. The first time you try your bike commute, allow double the time you think it would take you to get to work so you won’t be stressed.